Did you miss our latest Wellness Wednesday? It’s the one where we shared super-important, vital information on how to properly store your cannabis so that it stays fresh and doesn’t get dry, moldy, or lose its potency. Don’t worry though. We took notes. So if you weren’t able to be there, here’s the recap of our Wellness Wednesday event on how to properly store your cannabis! Dried-out flower. Vape oil evaporating too quickly or spilling out of cartridges. Edibles becoming stale and dry. These are just some of the things that can happen if your cannabis isn’t stored properly. Proper storage techniques don’t just save your products; they’ll also save you money. When you buy cannabis from us, the product will already be in protective packaging. Once that packaging is opened, you’ll need to take specific steps to maintain the product’s freshness and quality. Light and air are the two greatest enemies of fresh cannabis. Temperature and moisture are also major factors to contend with. 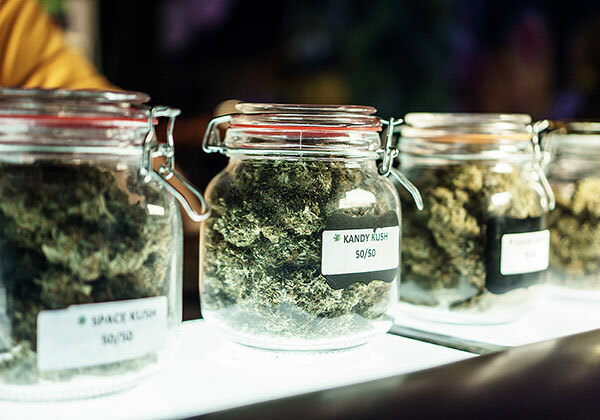 Light, heat, and oxygen exposure can degrade the quality of the cannabinoids and terpenes in your flower, causing it to develop an unpleasant aroma and flavor. Mason jars are commonly used to store cannabis because they’ve got a vacuum seal. Unfortunately, the see-through jars can’t protect medicine from light. However, you can get special, opaque Mason jars that ward off sunlight. Or you can just use a regular Mason jar but keep it in a drawer or cabinet. Treat your medicine like medicine. Always keep it in a sealed container to prevent it from being exposed to germs or other contaminants. Never leave your cannabis in a car or by a window, or it will dry out. Don’t store your cannabis in plastic bags. Plastic bags can accumulate static electricity which can cause your flower’s trichomes to fall off. The trichomes are the tiny, glistening crystals that you see on flower. These crystals are packed with THC, so you want to preserve them at all costs. Don’t store your cannabis flower in a fridge or freezer. Cold temperatures can cause the trichomes to become brittle and fall off. Ideal storage temperature is between 60-70 degrees. Optimum temperature is between 60-65 degrees. If the temperature in your home fluctuates with the seasons, change your storage location accordingly. Too much moisture exposure can cause your flower to develop mold. The best RH (relative humidity) level for cannabis is between 59% and 63%. Use humidity packs in your containers to help your flower stay fresh. Essence carries humidity packs, and you can also grab them from your local smoke shop. Do not store medicine that has not been cured properly. Improperly cured medicine can develop mold. Keep your vape pen in a carrying case or container. Don’t just toss it in your pocket or in your car where it can be exposed to high levels of heat. A container will prevent air bubbles, oil evaporation, and the possible leaching of cartridge metals into your oil. You can keep the pen in your pocket or purse as long as it rests inside an actual case. When you put your medicine in the trunk of your car, put it a cool, storage container. Medicine can be affected by temperature changes within minutes. 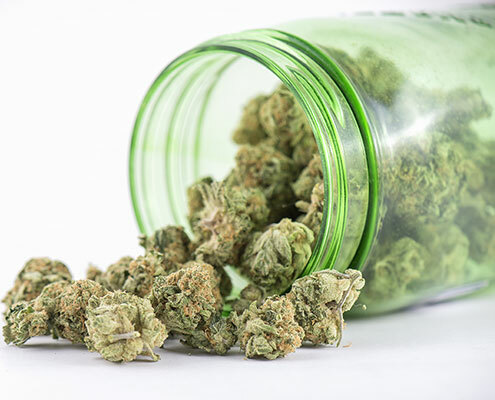 For cannabis drinks, considering using a vacuum-insulated travel mug or thermos to keep your beverage cool and protected from contaminants. The best way to preserve edibles is to keep them cold. Evergreen Organix products such as cookies, brownies, and macaroons need to be kept in the fridge. Products like chocolates and gummies can be stored on a shelf. Just keep an eye on the expiration date. You can also freeze your edibles to make them last longer. Don’t leave products in your car. If it gets too hot, the THC in your edible might start to break down. If your cookies or brownies get hard from staying in the fridge, it’s okay to microwave them for a few seconds to loosen them up. All Evergreen Organix packaging is child-proof, but for extra safety, keep your edibles in the child-proof bag that Essence gives you. Never leave your edibles where a child or pet can easily access them. ROVE vape cartridges are compatible with any 510 threaded vape battery. All ROVE cartridges come in child-proof boxes. When you’re not using the vape cartridge, remove it from the battery, place it in the storage box that comes with it, and store it upright to prevent the oil from leaking out. Don’t leave your cartridges in direct light or near heat sources. Best storage temperature is 65 – 70 degrees. ROVE hardware is made out of pyrex glass, which has a high melting point and doesn’t shed any micro-toxins. It can withstand the heat from a battery but still should be kept out of direct sunlight to prevent cartridge leaking. The vape cartridge also comes with silicon caps for the top and bottom of the cartridge. When you’re not using the cartridge, put the silicone caps on the cartridge to help protect it against air and heat. GLP packages their flower in glass containers with metal lids and plastisol seals. All products are packaged in environmentally-controlled rooms to keep the flower from drying out. If you’re just rolling a joint and not going to use your full eighth, take what you need out of the jar, and put the rest back in its regular storage location when you’re done. GLP offers a recycling program. If you return seven empty jars to our dispensary, you’ll get one free pre-roll, shirt, or hat. 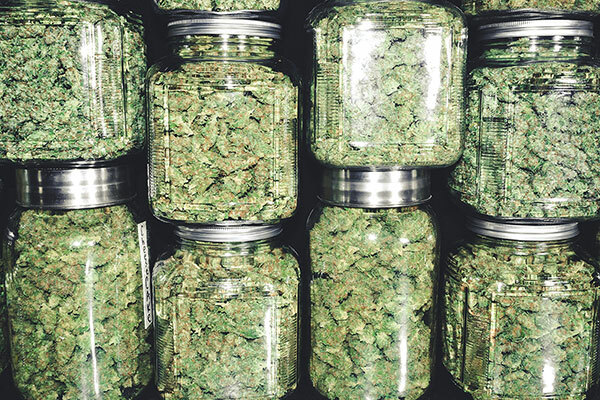 The jars are collected from the dispensaries, washed, and reused. At Wellness Wednesday, we offer a special discount to our attendees for that day only at our Henderson location. That day, we offered everyone 20% discounts on products such as Evergreen Organix BBQ, Honey Mustard and Hot Sauce, all Silver State Trading pre-rolls, The Cannavative Group Black Cherry Soda Honeycomb, and Select CBD disposable pens. We also held a raffle and awarded $1 pre-rolls to three of our Wellness Wednesday attendees. Want to Learn More About Cannabis and Receive Similar Discounts? Then come to our next Wellness Wednesday event! LOCATION: Wildhorse Golf Club, 2100 W Warm Springs Rd., Henderson, NV 89014. To learn more and/or to RSVP, visit our Events page.